I wanted to share the schedule the works for my toddler, and worked for his sister when she was a toddler, but I imagine that what works for you will be different. 7:00 On our best mornings, I’m up at this time, waiting in the kitchen with breakfast made. I’ve had a shower, a few minutes of Bible study, and an attitude that is ready to conquer all (or at least any temper tantrums that come my way!) At 7:00, our OK to Wake Clock turns green, and an enthusiastic five-year-old storms down the stairs. If her gusto to start the day hasn’t woken up her two brothers, I let them sleep. We have rough time frames in our schedule, anchored by a few big things. It’s best if our morning starts off slowly and peacefully. 8:00 Earlier this year, I rearranged our schedule to fit in a cleaning/getting dressed time. This might sound silly to you, but this was probably the best thing I could have done for E! He no longer fights cleaning up after himself in the morning, or getting dressed. In the past, we just hung out in jammies until we felt like going outside. Heck, sometimes we went outside IN PAJAMAS. This is an awesome perk of homeschooling, but as it turns out, it made those times when we actually needed to get dressed and get out of the house SUPER stressful. 8:30 Now that everyone’s dressed, we have some time to play together. I try to give E direct attention at this time, because I notice that it affects him for the rest of the day. I’m certain that many of his temper tantrums are from feeling a little left out. We play with trucks in our basement play room. Sometimes I’m able to fit in a lesson with Miss H at this time, if she requests it. In our basement playroom, reading books and playing with trucks, Lego Duplos , or dolls. 10:00 Snack time! No matter where we are, we usually have a snack at 10:00. This helps to anchor our days. Then, it’s back to playing! 12:00 is my panic time. If we aren’t home, or close to home, at noon, I start to feel a little anxious. We eat lunch around 12:15, and have about 45 minutes to chat and relax. 1:00 A goes down for another nap at around 1:00. I so wish I could tell you that E goes down for his nap then, too, but he kicked those naps right around 2.5. Instead, I use this as quiet time for my older kids. They play quietly in the basement together, read books, and sometimes watch a TV show. 2:00 After about an hour to myself, I go play with my kids. Miss H usually thinks up a craft at this time, so E ends up playing independently. But, being in the same room as him seems to make a big difference. 4:30 After moving from room to room today, we’ve made lots of good messes. I ask the kids to clean up. E sometimes fights this. He’s usually very good at cleaning up his toys, but it’s the other things he pulls out during the day that make the house feel messy: the socks he threw off haphazardly, the three different pairs of shoes he wore. This is the habit we’re currently working on. Telling my kids to go clean something without actually following them to be sure that they are indeed cleaning is the only way to get them to play together happily. Ha! So, some days we all clean together, and on some days, my kids go play like they’re best friends in order to avoid me. 5:00 It’s time to start dinner. Sometimes they are still “cleaning” and this makes it easy. On more restless days, I let them watch a TV show. On nice summer evenings, they play outside while I cook. It varies. 6:00 Nate gets home from work around 6:00, and we eat dinner right away. Ideally, we finish dinner by 6:30 or 6:45 so there’s still a little time to play before bed. We don’t give baths every night, so that frees up some of our time in the evening. 7:00 We started to put E to bed a little earlier once he gave up his nap. He often melts down by 7:30, and then he gets upset when he sees me put Little Brother A down to bed. So we’ve learned that putting him to bed before his nap-loving little brother is best for everyone. We try to put him down to bed at 7:15, which gives him almost 12 hours of sleep. Right now, my priorities for my toddler guy are that he gets plenty of sleep, and that he gets plenty of time outside each day. These two factors seem to affect the number of meltdowns we have. Unlike his big sister, he does not ask me to read him books multiple times a day. I’m sure this would make some people nervous, but he is in a language-rich environment. He hears stories when I’m reading to his siblings, and he also reads books that he chooses before bed. Your schedule will undoubtedly be different, but the important thing to remember is that children thrive on routines. These routines, that give our children comforting structure, are also what will aid us in habit training. By doing similar things everyday, we are establishing those triggers, the things that set off good habits. I don’t try to fit in ALL THE THINGS in our day, and I don’t stress if we don’t tally up four hours of time spent outdoors. My biggest concern right now is that my children have consistency in our home, and that they know they are loved. 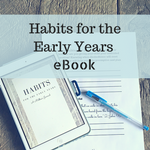 This early years planner was created just for you, so that you can add consistency to your days. Plan out daily routines, habits, and choose from a list of Charlotte Mason recommended activities to plan your days. You can find the planner here.